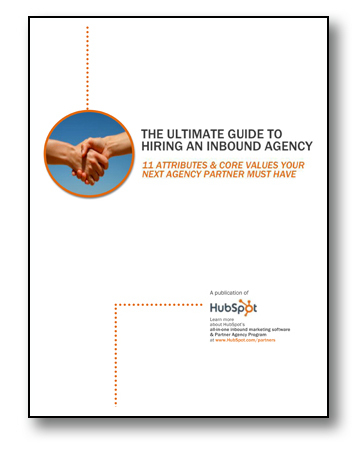 Get The Ultimate Guide To Hiring An Inbound Agency: Free eBook! Are you considering hiring an inbound marketing agency? We've compiled the key traits to look for in a brand new free ebook. Marketing dollars have shifted away from traditional outlets like PR and cold calling. But the skill sets of internal teams lag behind. For some, the time and resources needed to train internal people on how to master inbound marketing musthaves like SEO and email marketing do not exist. As a result, businesses wanting to take advantage of ROI-charged online tactics like blogging and social media are looking to outside agencies for help. These agencies can use their deep online experience to help companies and businesses short on time and internal resources increase their online visibility and lead generation efforts. When hiring an inbound agency, it is not one-size fits all. Agencies come in all shapes and sizes, with different specialties and talents. This ebook will help you discern the core values and skill sets that make some better than others.